Not long ago I read an article online about historically important African American communities in the United States. A few of them I had heard of, but several were new to me. I was particularly surprised to read about two of them, because they were located in Southwestern Illinois. Both towns were begun by free slaves and were also home to large numbers of runaway slaves. The towns were each integrated as well. But what really struck me was the different ways in which these two communities have been remembered. While one enjoys active local preservation efforts the other has been all but forgotten. This got me thinking. How do we decide what gets remembered and what gets forgotten? Is it simply a matter of luck that certain places and objects get preserved, or is a conscious choice made? One of the nearby African American communities mentioned in the article was called New Philadelphia. Situated in Pike County, it was founded by a family of former slaves in 1836 and became an active, racially integrated town even before the outbreak of the Civil War. When the railroad was laid in the area, though, it bypassed New Philadelphia, and the town started to lose its population in the 1880s. Today, however, the site it once occupied is commemorated and preserved by both locals and archaeologists. Since 2001, there have been at least three archaeological studies done at the site, and a New Philadelphia Association and website have been created to encourage the preservation of what local citizens feel is an important part of their history. The story of the other village, known as Pin Oak Colony, is quite different. Pin Oak was located just east of Edwardsville, Illinois, on the Marine Road near Silver Creek, virtually in my backyard. When I read about this village for the first time it was just a small blip in a larger article, so I set out to find more. To my dismay I found that it was not going to be easy. I could only find a couple of articles online about it, and there were no community groups formed for its preservation. My husband and I then went for a drive to find the site where the village had once stood. Unlike New Philadelphia, there are no commemorative signs alerting passersby to the fact that they are in the location of a historic site. All we could find was a road and a nursing home named Pin Oak on the outskirts of Edwardsville and a Pin Oak Township within Madison County. These small, almost bureaucratic markers of a former historic site seem quite inadequate to me. If one did not know of Pin Oak Colony, these modern names would do nothing to inform of it’s existence. Why would the fates of these two similar communities by so different? 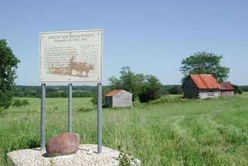 I believe that New Philadelphia has been remembered because its location is quite rural, and there are fewer historical sites to commemorate. But I think the story of Pin Oak is more complicated. I am sure that part of the mystery can be explained by the growing city of Edwardsville. Pin Oak was simply taken over and incorporated into the larger metropolitan area. But the troubled history of segregationists and abolitionists in Edwardsville needs to be taken into account as well. Perhaps it was political quicksand to attempt a preservation of a nearby African American community, and, after some time, Pin Oak was all but forgotten. This is worrisome for me, though. How much of our history has been forgotten and left in the past simply because it is too controversial? I do not think that we should shy away from thorny issues, because they, too, had an active hand in shaping our present. Messing with the Laws of Physics: Can One Historic Site be in Two Locations at Once? Who Pays for Public History? Add your email address to receive new posts in your inbox!